On Easter Sunday, President Obama successfully concluded his long search for a new White House dog but made no progress in his simultaneous quest for a new church for his family. Could the contrasting status regarding the First Family’s two most publicized private decisions indicate that the President actually cares more about canine companionship than religious commitment? 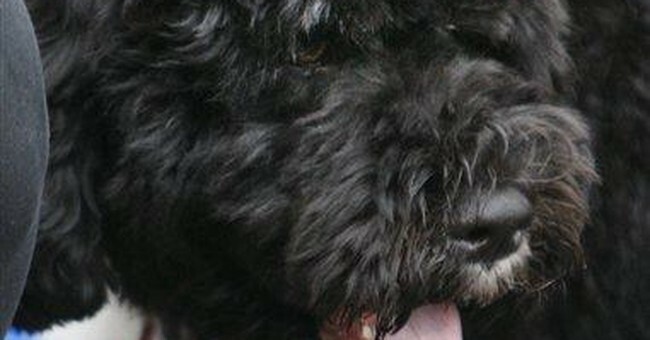 While the Obama girls welcomed Bo, the pure-bred and specially trained six-month-old Portuguese Water Dog, the Obamas attended Easter services at St. John’s Episcopal Church – the 200-year-old “Church of Presidents” across the street from the White House. Presidential staffers, however, indicated that the First Family hadn’t even come close to a final decision on a new spiritual home, after their mid-campaign repudiation of the long-time Chicago church where they worshipped with the bombastic, America-loathing pastor, Jeremiah Wright. Amazingly, their Easter visit to St. John’s represented their first participation in Christian services since the inauguration – a period of nearly twelve weeks. The White House press office noted that the President had spent several weekends at Camp David, and that the Presidential retreat contained a private chapel, so that he might have worshipped there privately with unannounced clerical visitors. In actuality, anyone who has noticed Mr. Obama’s eagerness to tout his own Christian credentials would doubt that any such service would have been conducted without publicity. The President even made a point of grabbing press attention for his attendance at an impromptu “White House Seder” in which he celebrated Passover with some Jewish members of his staff. The absence of rabbis or religious scholars demonstrates the relative unimportance attached to this “ecumenical” event by the Obama team; if the President had desired a more substantive learning and sharing experience for Passover, he might have included any number of luminaries, Jewish and Christian, rather than limiting the experience to White House insiders like Valerie Jarrett and David Axelrod. In any event, the President has every right to continue to take his time in finding a new church, but his delay seems to contradict his self-description as a “devout Christian” in his books, speeches, and interviews (including the adoring Newsweek cover story, “The Faith of Barack Obama”). Spending the first three months of a presidency without attending church is hardly an indication of bad character, but it is a reflection (at the very least) of a lack of conventional piety. In fact, Mr. Obama’s declarations of faith and church visits both seemed to peak at the height of the Presidential campaign as a means of counteracting the stupid rumors about his secret Islamic affiliation (the Pew Poll shows an appalling 11% of Americans still think he’s a Muslim!) as well as separating himself from the ranting and raving of his polarizing pastor. Now that he’s secured the presidency – and that Newsweek celebrates “The Decline and Fall of Christian America” in a cover story – suddenly the need to expose himself to religious services feels less urgent and important. Many religious believers have begun to turn away from politics in disgust, in part because of the suspicion that candidates of all ideological orientations manipulate religious symbols and organizations for their own benefit. In this regard, Ronald Reagan represents the rarest sort of high office-holder – a President whose private, personal faith commitment and Biblical engagement was actually far more intense and significant than the public assumed during his presidency. In failing to match religious pretense with personal priorities, Obama isn’t outrageous or egregious, but rather typical of politicians (remember Bill Clinton, Al Gore, and John Kerry at the height of their campaigns?) who make public displays of faithfulness while campaigning for the presidency, but give little indication of ongoing engagement between major elections. The desire of such ambitious politicos to connect with America’s religious majority (despite Newsweek’s pronouncement that 75% of the nation’s citizens still describe themselves as Christians) still shows the potent influence of faith-based norms in the nation that remains by far the most religiously committed society in the West. Even so, the percentage of the unchurched and unaffiliated has grown dramatically, so Barack Obama could find plenty of company in giving priority to pups over pastors, and to dogs over dogma.